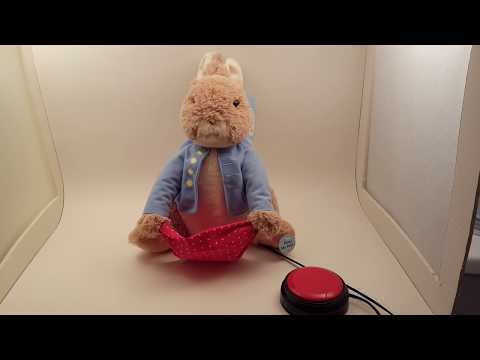 Peek a boo Peter Rabbit switch adapted toy for kids with disabilities. Beatrix Potter`s classic Peter Rabbit has his signature red handkerchief out and ready to play a game with you! Peter speaks with an adorable British accent and hides behind his hanky before popping back out to play an interactive game of peek-a-boo. Adapted to accept a switch with a standard 1/8" plug, sold separately, or can be activated via the button on his paw. Press and release your switch to start the peek a boo fun. 10" tall. Surface wash. AA batteries required, included.